Sadly Reg passed to the Grand Lodge above 23rd October 2016 just two weeks short of his 97th Birthday. Several Members and their Ladies attended his funeral 3rd November 2016 at Sutton Coldfield Cremotarium. On being demobbed from the Army in 1948 Reg started work at Kings Heath Engineering Company where he met W.Bro. Fred Shelley who was a member of Francis Davis Lodge N0.5035. Reg and his wife Betty were invited to attend various Ladies Evening and other Masonic Social Evenings. Reg and Betty enjoyed the company and atmosphere at these events and with Betty’s blessing Reg decided that Masonry was for him. At this point Reg approached Fred Shelley who suggested that rather than join Frances Davis he should wait and join a new Lodge that was being formed by members of Francis Davis and Masefield Lodges where promotion in this new Lodge would be rapid. The new Lodge was to be called Weatheroak Lodge N0.7214. Reg was proposed by W.Bro. Fred Shelley and was initiated on the 15th February 1955, W.Bro. Charles Hill, P.Prov. G.W. was the Worshipful Master with W.Bro. Fred Shelley acting as Junior Deacon. On that same evening the Lodge Banner was dedicated, this ceremony was carried out by W.Bro. Dr. D.L. Bunting Deputy Provincial Grand Master ably assisted by W.Bro.H.E.Clive Asst. Prov. Grand Master. Reg was passed to the degree of a Fellowcraft Freemason 18th October 1955 and was raised to the sublime degree of a Master Mason 17th January 1956. Of course progression through the various Offices in this newly formed Lodge was not rapid as many of the Founder Members desired to be Worshipful Master of Weatheroak Lodge. Consequently Reg held the Office of Steward for seven long years and it took him twelve years to reach the Master’s Chair. Reg was installed as Worshipful Master on the 104th Regular Meeting held 19th September 1967 by W.Bro. Vincent C. Williams. The Provincial team in attendance were: the right Worshipful Provincial Grand Master Lt. Col.O.W.D.Smith D.L., J.P. W.Bro.H.W.King P.S.G.W., W.Bro. A.E.V. Meredith P.J.G.W. and W.Bro.R.G.Ruggles P.P.A.D.C. At the second Rising of this Meeting – Proceeding of Provincial Grand Lodge. The Secretary read out a report on the Proceedings of P.G.L. and referred to the items directed. A Petition for the Foundation of a new Chapter of Royal Arch Masons to be called the “Weatheroak Chapter No.7214” was presented to W.Bro. E. Jim Toy supported by W.Bro. Charles H. Hills, W.Bro. N.H.Stamps and several of the founders of the proposed Chapter. The acceptance of the petition was moved by the W.M. and the motion was carried by a unanimous vote of the Brethren of Weatheroak Lodge. Thanks were tendered on behalf of the founders of the Chapter and the petition was signed by the W.M. W.Bro. Reginald Stephens and his Wardens. Currently there are 12 Members of this Lodge in WeatherRoyal Arch Chapter No.7214 of which 7 are First Past Principals. His first ceremony after being installed as Worshipful Master was to initiate, on the 17th October 1967 Mr.Kenneth Brindley a colleague from work, who like Reg became an Honorary Member of Weatheroak Lodge and is also P.Prov.S.G.W. He also Passed Brother Ken to the degree of a Fellowcraft 21/11/1967 and to the sublime degree of a Master Mason 19/03/1968. He has also been Director of Ceremonies at Ladies Evenings where he was always accompanied by his wife Betty and 9th December 1967 she enjoyed her Ladies Evening with daughter Rosemary and her husband Barry in attendance. N.B. It is with regret Mrs Betty Stephens passed away 22nd April 2012 just a few days after her 90th Birthday. Reg is known throughout the Province a very good ritualist and one of the few members of Weatheroak Lodge who has presented part of the First Degree Tracing Board and the extended version of the 2nd Degree Working Tools. He was also Preceptor of the Lodge for five years and is always keen to accept an acting office at Past Masters Night. and Worshipful Master a record 14 times. Regs Provincial honours – 1972 Prov. A.G.Supt.Wks. – 1982 P.Prov.G.Reg – 1998 P.Prov.S.G.W. 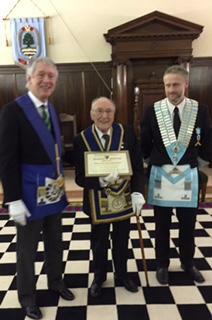 Reg was also became an honorary member of Weatheroak Lodge in 20th April 2004. On 15th February 2005 the presentation of a 50 year certificate for his services to Freemasonry was presented to W.Bro. Reginald Stephens exactly 50 years after he was initiated into Weatheroak Lodge 15 February 1955 by W.Bro. Colin V. Young P.S.G.D. Asst.P.G.M. On this occasion it was the toast to Reg was given by W.Bro. Ken Brindley who Reg initiated into the Lodge in 1967. Reg at 95 years of age is still a member of Walmley Golf Club, he recently gave playing golf but the golf Club is still his favourite place for lunch. W.Bro.Ken Brindley P.P.G.W & W.Bro. Peter O’Shaughnessy P.P.G.Supt.Wks.